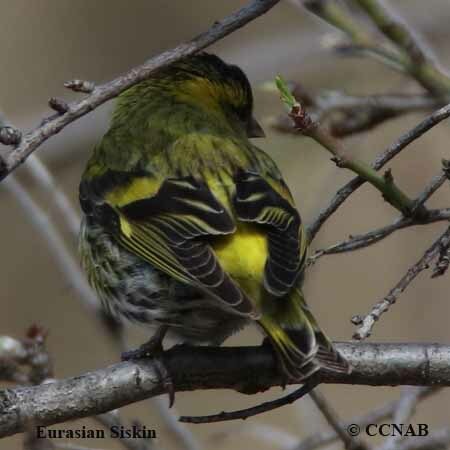 There are two types of siskins seen in North America. The Pine Siskin is the only native bird and is found throughout North America, where pine and spruce cones are available. The Eurasian Siskin is a common bird throughout Eurasia and has been seen on the North American continent and is more likely observed on the mainland of Alaska, the islands in the North Bering Sea or on the Aleutian Islands chain. In the winter months, siskins travel is flocks, behaving like nomads. If birdfeeders are available, it is not uncommon for them to stay the whole winter. They have been known to stay and even make their nests and raise their young wih help from the feeders.